The electrocatalytic reduction of carbon dioxide using renewable electricity and an appropriate catalyst is a promising green manufacturing method to produce chemicals and fuels sustainably. Methanol is one of the most valuable products that can be generated from this process. Apart from its use as a fuel, it is also employed as a chemical building block to produce more complex chemicals such as acetic acid. While the chemical structure for methanol may be simple, its conversion efficiency from carbon dioxide is poor. A research team led by Prof Yeo Boon Siang, Jason, from the Department of Chemistry, NUS in collaboration with Dr. Federico Calle-Vallejo from the University of Barcelona, Spain has discovered that zinc dendrites deposited on silver foam (termed as PD-Zn/Ag foam), can be used as a catalyst to convert carbon dioxide to methanol with high efficiency. Zinc and silver metals by themselves, and their alloys, are more effective for converting carbon dioxide to carbon monoxide. However, by patterning them at the nanometer scale, their functionality as a catalyst can be enhanced. 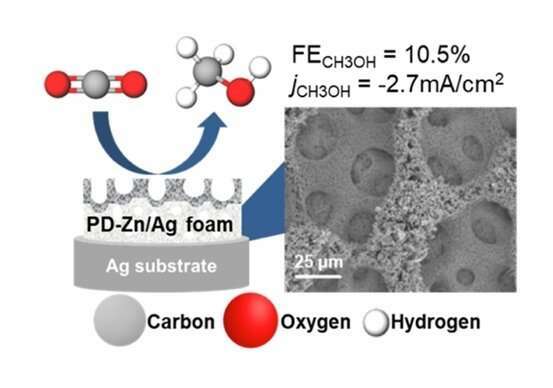 The resulting PD-Zn/Ag foam is able to produce methanol with a Faradaic efficiency and current density reaching as high as 10.5% and -2.7mA/cm2, respectively. This represents a tenfold increase over conventional zinc-silver catalysts. Using experimental results and theoretical calculations, the catalytically active sites were identified to be strained zinc dendrites deposited on the silver supporting material. These active sites bind to carbon monoxide intermediates strongly, which in turn facilitate their conversion to methanol. Prof Yeo said, "This work illustrates that nanostructured bimetallic systems can enhance both the activity and selectivity of the catalytic carbon dioxide reduction reaction. The research outcome can be exploited to design and synthesise catalysts with improved functionality." Building on the research findings from their work, the research team plans to develop catalysts with higher methanol conversion efficiency.